Care Packages for Soldiers: "I think it is just a little taste of home they need." "I think it is just a little taste of home they need." Here is a note and a few pictures we received from some Marines that received several of the care packages we mailed in October. The boxes contained food, snacks, toiletries, Halloween decorations and thank you notes written by school children. As you can see, these care packages are greatly appreciated by the troops. I can not thank you enough for your generosity. It has been great receiving these care packages and seeing the reactions the Marines have had. They are so thankful for what they receive. I think it is just a little taste of home they need. I had some Marines decorate our command post with the Halloween decorations (sorry it is a secure space could not take pictures). I am in a unique position where I have the ability to travel the battle space and see many different Marines at many different bases. Every time I travel I take as many as 30 boxes with me to places where Marines are living in fox holes and don't have running water or hot food. 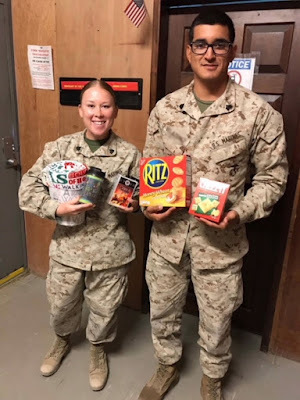 These marines are so grateful to open a package of snacks and hygiene products. I am trying to get more pictures but some areas are very secure and photos are not allowed. 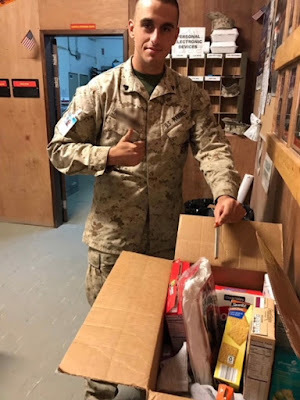 I have given the Marines instructions after reading the letters inside the packages to write a thank you letter to the children that not only donated, packed but took the time to write to them. Many of my Marines have sent out correspondence to children. What you do for my Marines and the Marine Corps I could never repay. This Marine is happy with the snacks and toiletries in the care package. These three Marines are holding blankets that were included in the care packages. The boxes also contained snacks. 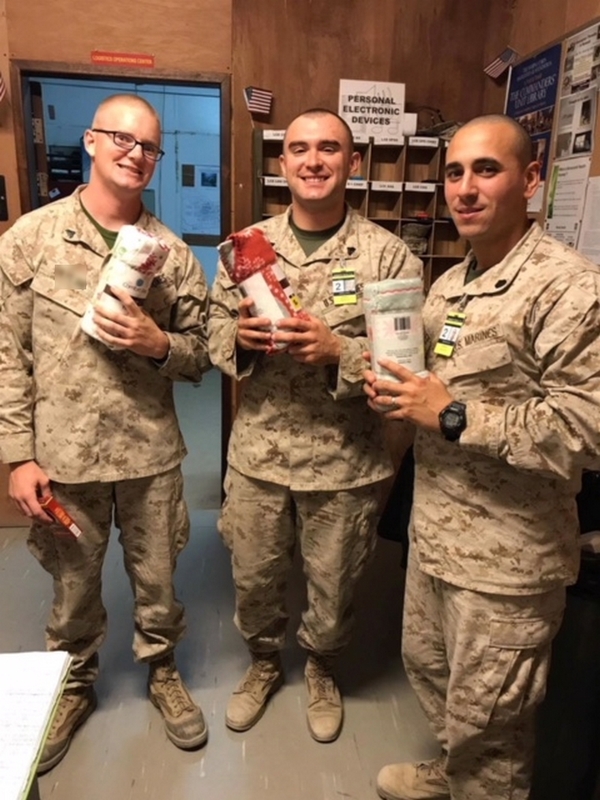 The care packages are a big hit with these Marines. If you are looking for an opportunity to send some encouragement and support to American troops overseas, we would be very grateful for any financial support. There are many ways you can help; you can send requested items to us to be included in the care packages, donate funds through the Click and Pledge link at the top of the page or send checks made payable to: Airborne Angel Cadets of Texas, P.O. Box 116691, Carrollton, TX 75011.